Sally Hansen Big Polish Guards Cuticle Protectors are a Must-Try! 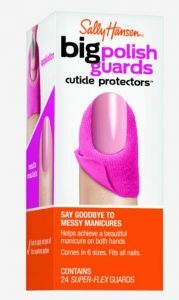 You are here: Home / Beauty and Fashion / Sally Hansen Big Polish Guards Cuticle Protectors are a Must-Try! I tried these out for myself and I love them! I always get nail polish on my cuticles and I love how easy these are to use! They are my new favorite to-go-to beauty product! Self Disclosure: I received a free sample and image was provided.